This summer we’re proud to present a solo show of ceramic works by one of our newest members, Stockbridge VT artist Deborah Goodwin. The exhibit, Fabrications in Clay, will be at the Guild Gallery from June 29 to August 28. If Deborah’s pieces resemble fabric, there’s a good reason. “I’ve borrowed techniques from apparel manufacturing,” explains the former fashion merchandiser, “making a pattern and embossing clay slabs with fabric textures.” The combination of supple fabric details and hard clay makes a comfortable, casual fit. “All my pieces are functional, with a – hopefully – fun twist,” Deborah adds. Deborah brings her fresh, tactile approach to familiar forms like platters, pitchers, ginger jars and serving ware. Strata,the largest piece in the BAG show, is a series of nine interconnected tiles, or trivets. “I envisioned each trivet as an individual work but wanted the textures and colors to flow throughout the whole installation,” she says. Deborah holds a BFA in ceramics and sculpture from Denison University in Granville, Ohio. She discovered the Brandon Artists Guild during vacations in Vermont while working as a clothing designer in New York. In 2007 she and her family moved to Vermont and she rekindled her passion for ceramics. She joined the BAG as an exhibiting member in 2017. 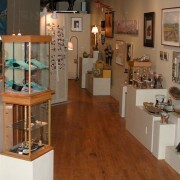 The Guild Gallery, at 7 Center Street in Brandon, is open Monday through Saturday from 10AM-5PM, and Sunday 10AM-4PM. 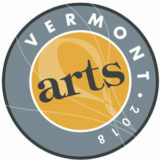 This show is part of Vermont Arts 2018 – a year-long celebration highlighting arts events across the state, sponsored by the Vermont Arts Council. The gallery is open Wednesday - Saturday 10am-5pm, Sunday 10am-4pm. Come browse both traditional and contemporary arts and crafts by our 30+ member-artists. Join as a non-artist member and enjoy a 10% discount on gallery purchases plus invitations to exhibitions & events. Or join the Guild as an exhibiting artist – artists and artisans in all media are invited to apply to our Spring or Fall juries.